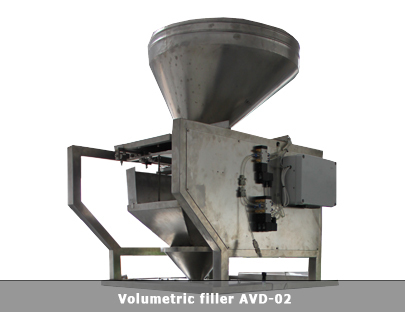 The volumetric fillers are independent devices, which are normally mounted to the packaging machines and work together with them. The main function of the dosing device is the separating of the product into predefined doses, which are set by the machine operator. The ready doses are then fed to the packaging machines. 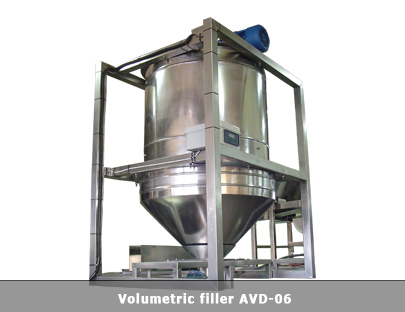 This type of dosing devices can be used for the dosing of free-falling product with a stable ratio volume-weight. Generally, the dosing device consists of a dosing box (with predefined dimensions), which moves from a position where the volume is filled gravitically with product by the intake bunker, to a position, where the dosing box unloads the product to the packaging machine. The dosing box is produced in accordance to the desired dosing range. 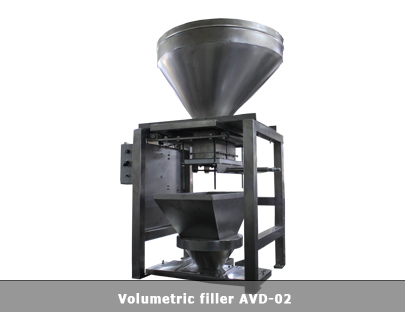 When constructing the volumetric dosing device, it is important to specify the bulk density of the product that will be dosed. Dosing range In the range of 50-1000g. Adjustment of the dose volume in the range of a single dosing module. YES. In the range of about ± 20% of the dose volume. Interchangable dosing module. YES. If the desired doses are in a too wide range, additional interchangable dosing modules can be produced.